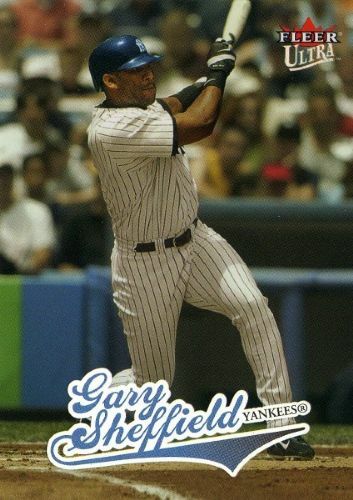 Over the two-year period between 2004 and 2005, Gary Sheffield was the best player on the Yankee team. He was the best hitter, the best fielder, an outstanding base runner and he had a cannon for an arm. He played hurt. He hustled on every play and for the most part, he got along with his teammates, Manager Joe Torre and the Yankee front office. He made me a true Gary Sheffield fan during those first two extremely productive years as a Yankee. I loved to watch him take some of the American League’s best pitchers, extremely deep into counts during at bats that would always include at least one and sometimes several rocket line drives into foul territory down the left-field line. I found it incredible that a guy with such a powerful swing did not strike out all that much which meant a very efficient on base percentage and plenty of run scoring production. Then in 2006, Sheffield injured his wrist in a late April game and didn’t return to the lineup until September. By then, the Yankees had acquired Bobby Abreu to play right field and had probably already decided to not resign Sheffield. Sheffield realized this as well and reacted by becoming a much more divisive force in both the New York media and the clubhouse. He felt unappreciated and responded more like a child than an adult professional athlete who had already earned millions of dollars. I had the opportunity to watch both Sheffield and Abreu during their Yankee careers and given my druthers, I would much prefer to have a healthy and happy Sheffield as my favorite team’s right fielder. My problem with Gary is that I think he was a pretty significant steroid user and nothing he’s said or done to refute that allegation has succeeded in dampening my suspicions. Sheffield’s last big league season was 2009. He retired with 509 home runs and a .292 lifetime batting average. He was born in Tampa and turns 43 years old today. He also shares his November 18th birthday with this former Yankee reliever and this one-time Yankee utility player.